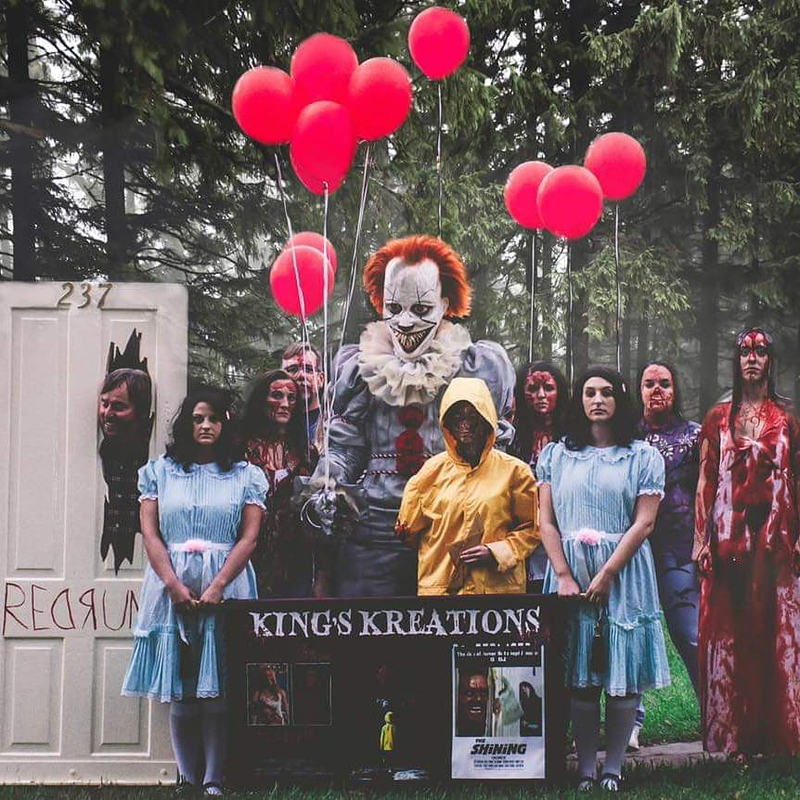 This is my handmade "King's Kreations" costume. 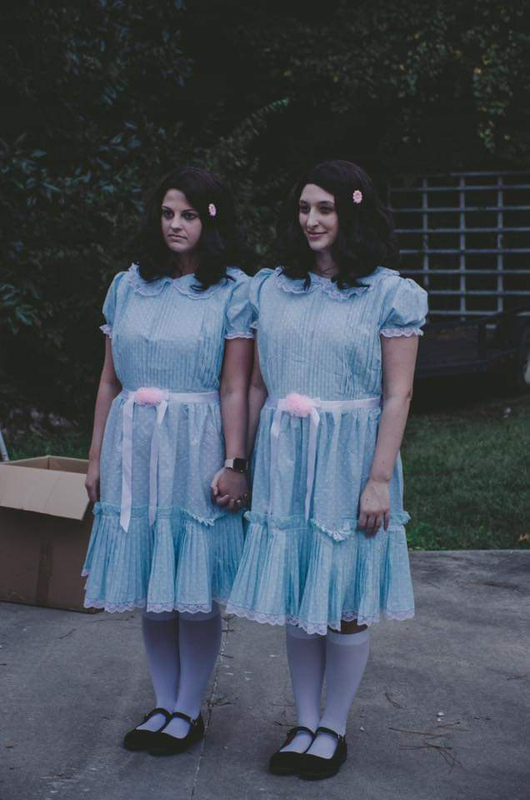 All costumes were sewed by me and my grandmother, all props were fabricated by my husband, and the mask was hand sculpted, cast, and molded by me. I molded the mask off of the moment when Pennywise jumps out of the projector screen! This was a long project with lots of small detail included. We also compete with these costumes in the 3 casinos in our area so we have to meet certain size requirements for all costumes. 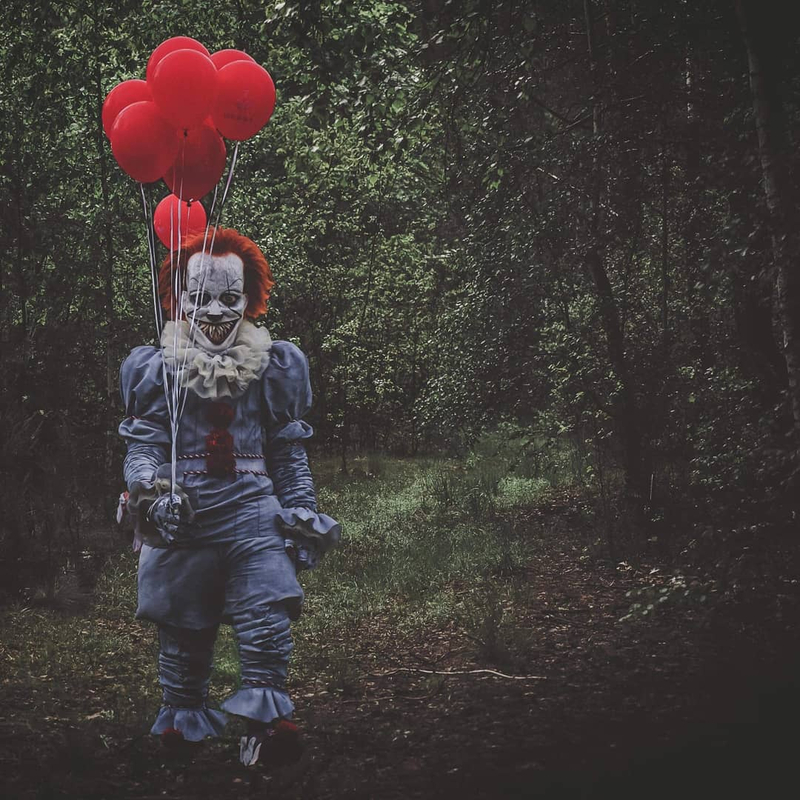 Pennywise was about 7.5ft. tall. 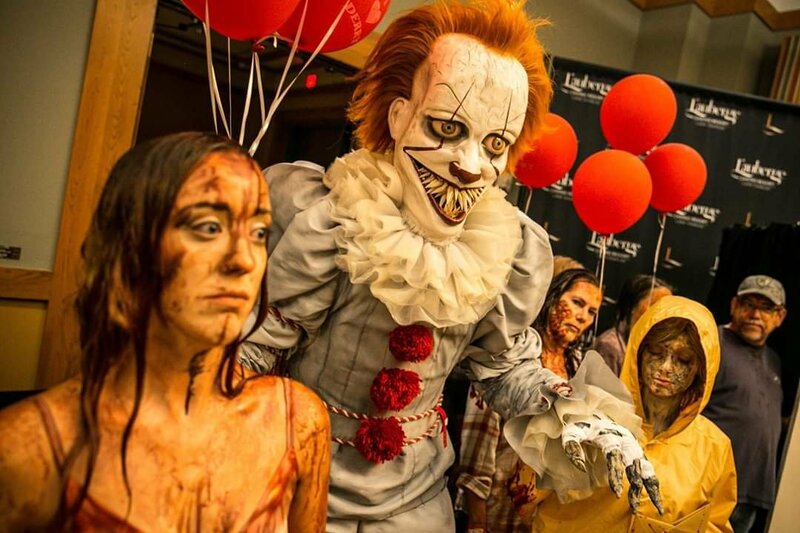 His mask put the majority of Pennywise's face above my husbands head and he was able to see out of the mouth to give the illusion of more height without stilts. His shoes were also built up about 5 inches to add to the height. I added a few dead "Derry townsfolk" to add to the ambience because we wanted there to be a sea of red balloons as we walked in. His mask took me a few weeks to sculpt and weighed 50+lbs in clay once completed. The mask was then poured in flex-it foam so it would be durable and have some motion and to cut down on the weight. I hand painted all detail and then began punching the hair which felt like it took me the whole month of October to finish! 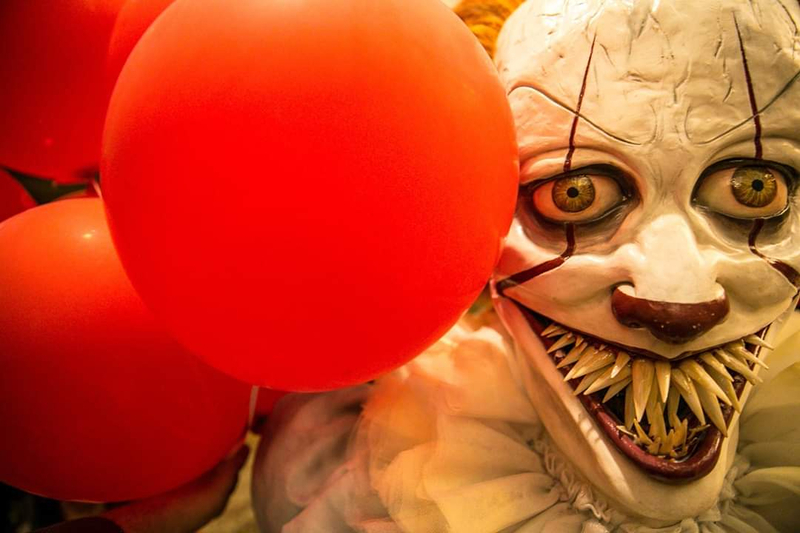 :-) The teeth were made from very long fake fingernails and we cut to length and painted to give them a yellowed look befitting a demon clown. For Carrie we used pictures from themovie to make sure to get her dress style was correct and my little sister fit the role perfectly! 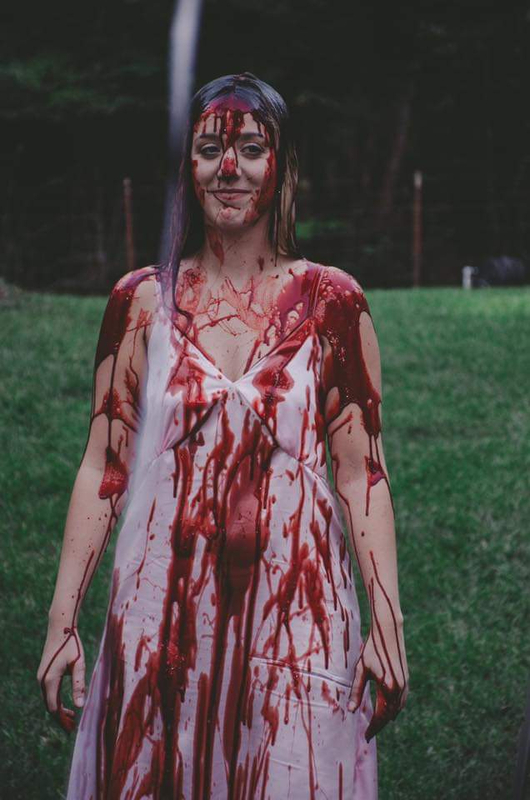 A gallon of blood that I actually poured on her head like in the movie and she was set to go! For Jack Torrence I wanted to not just have him there but to also recreate his iconic "Here's Johnny" scene so I wanted a panel that could be busted through in the door for dramatic flair. His door was framed out in aluminum tubing and a speaker system was installed inside so we could play the skit music and also some creepy music as we walked into the casino. I added the REDRUM graffiti and of course room number 237. 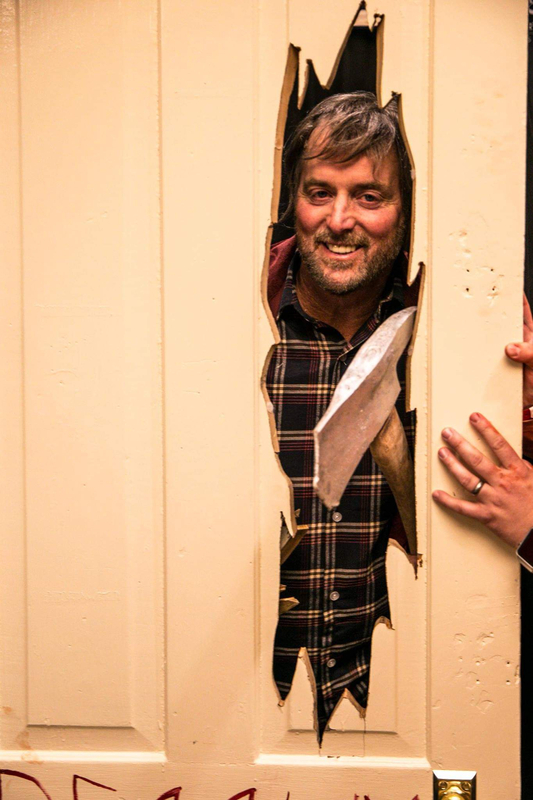 My dad was finally talked into being my Jack Torrence for the night! This costume was definitely a family affair! We took 2 firsts and 1 second at the casino's and took home some nice cash and prizes. The reactions were priceless and we lost count of how many pictures we had to stop and take with the patrons at the casinos. This is my first attempt at a full mask and I was very pleased with the outcome. Attached is our video of our skit from the casino. My husband scared the lady with the red gloves so bad when he rushed at the judges I had to catch her from falling backwards.